About the further fortunes of the Vale family . . . 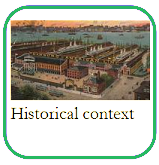 The Vales belonged to the elite social world of Boston around 1930. A fortunate group that traveled, that took for granted their sons would go to Harvard, and brought out their daughters at magnificent cotillions. The supreme social rite of the 1920s and 1930s in Newport and Boston, the debutante party might carry on until 5:00 in the morning. In 1930, when the U.S. population numbered 122 million, the privileged few could sail through life with plenty of leeway. Let’s go in and enter their world . . . Article addresses this earlier misconception. Prouty was really a bit of a freethinker. The enlightened psychology running through the Vale novels. 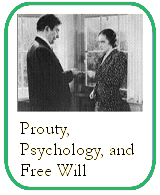 Relate Prouty&apos;s insights to those of Dr. Albert Ellis and RET — Rational-Emotive Therapy. Olive Prouty and Walt Whitman — both celebrate the human spirit and the democratic ideal of America; they accept the dignity of each of us. 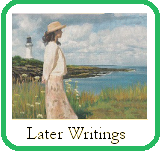 Both took a transcendent view of America, as shown in a poem of Whitman's that describes the bells tolling the death of a President, and a passage from Prouty's first Vale novel. Both took a freethinking stance on life. 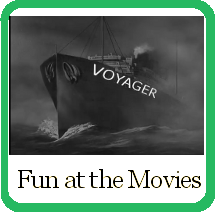 Prouty's memoirs, including her experiences with turning Now, Voyager into a movie, and a collection of her poems. Letters between Olive Prouty and her editor at Houghton Mifflin during the writing of Now, Voyager. 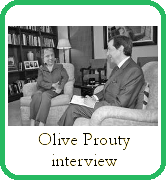 Imagined interview with Olive Prouty at her home in Brookline, Mass. TCM looks in-depth at our favorite movie. A summary of Olive Higgins Prouty&apos;s work and life provided by the Unitarian-Universalist Historical Society. 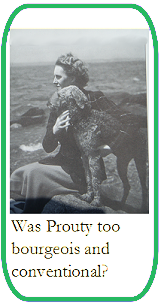 Olive Higgins Prouty: Biography, Works, Photos, Quotes provided by the Worcester Polytechnic Institute, where Prouty's father played a role in its early years. 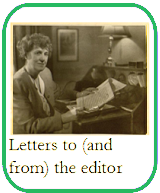 Clark University of Worcester Mass, holding the Prouty papers in their archives, has created this Prouty timeline, complete with a list of her writings and publications. Crowd-source wisdom comes through again.